Nigel Brown AWCF and Ed Simcock Dip WCF have worked together in competitions for a couple of years now; a partnership that is proving to be a successful one with a win in the Fireman/Doorman Competition at Devon County Show back in May this year. Here Nigel reports on a clinic they attended with Gary Darlow - this was a purchase at the extremely successful charity auction held at the Handmade Shoes (UK) Ltd Competition Dinner in July. 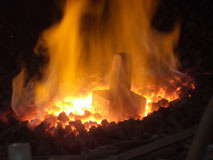 "On the morning of Saturday 8th September 2007, Ed and I travelled to Gary Darlow's forge in Cheshire for a clinic focusing on tool blocks. We started by making a mould of Gary's block - this was done by sledging through approximtely 4 inches on a three foot bar of 5/8 square. This gave us an exact match of section to Gary's block. 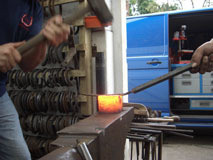 We then welded 6 inches of 10mm round bar to the top surface of the tooled section. This is so that we can strike the tooled section into the new block without hitting the top of the block or damaging the tooled section. 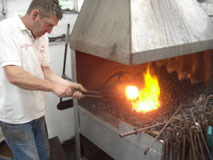 We then heated the new block (approximately 3 1/2 by 3 1/2 inch square mild steel) to a white 'dripping' heat. 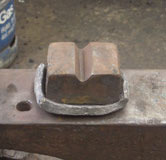 The heated block is then put in the hardy hole and a piece of 10mm round bar is used to make the initial indentation. 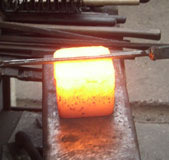 (This bar can be welded to the end of a 5/8 square bar to make it easier to hold). 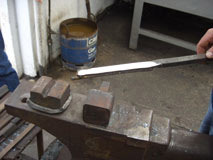 This bar is struck to it's full depth into the new tool block. It is important at this stage to make sure that the bar is straight and travelling through the centre of the block. 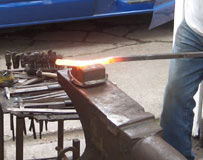 A new heat is then required (again to a white, 'dripping' heat) before sledging in the tooled bar. Make sure the groove in the new block is to the depth of the foot surface of the tooled section. 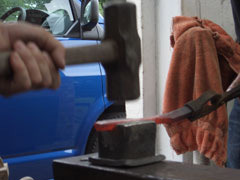 Complete the new tooling block by wire-brushing and dropping in a tank of water to allow to cool. 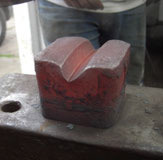 Once cooled the block is ready to be used. This was something neither Ed or I had not done before and the trip to Cheshire was well worth it. Gary made it very easy, demonstrating a very direct and uncomplicated way of working - hardly surprising that he has won 7 National Championships!"